For those who haven't been following Mirasol, it is a functional equivalent of a traditional black-and-white eInk display that has become so popular in e-readers over the last few years, except it is capable of displaying color and playing videos (refresh rates are rumored to be anywhere from 12 to 30 fps). At its core, Mirasol screens use a reflective display technology which "can create various colors through the interference of reflected light." 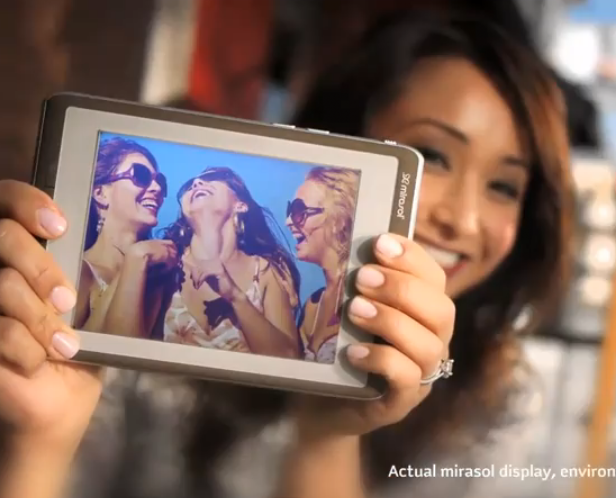 Mirasol displays consume very little power and have superb visibility in direct sunlight. We'll be keeping an eye out for an actual real-life demo unit today and tomorrow, but in the meantime, feast your eyes on this freshly published demo of a Mirasol-powered Android e-reader and think of the possibilities. I haven't been able to confirm this but the rumor is that in a still state, similar to eInk, Mirasol does not use any power. Who needs Pixel Qi when you've got this, huh?